Brandi Jasmine is an artist who lives in the Niagara Region, Ontario, Canada. She began her career by hand painting t-shirts in Vancouver BC, in a small shop called “Angel Handpainted Fashions”. Later, she moved to Toronto and it was here that she developed an interest in computers and desktop publication. 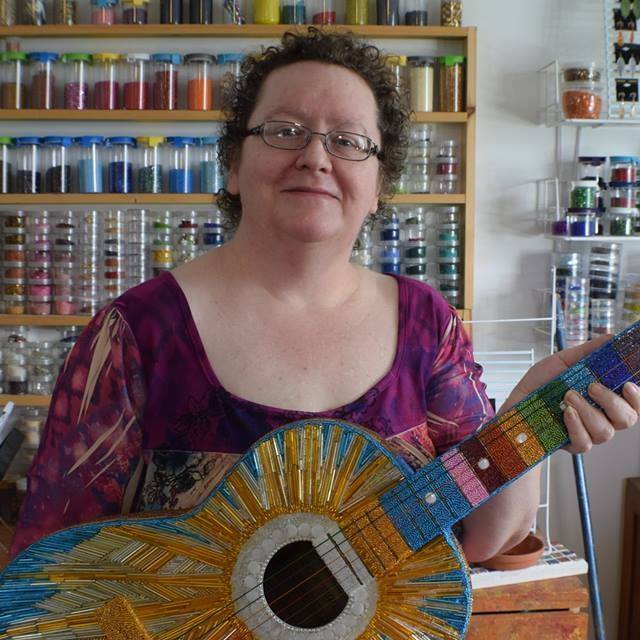 Brandi is proficient in watercolor, fabric-painting line-drawing, acrylic painting, and photography. She is also a self-published author and the writer of dozens of magazine articles. Brandi’s artwork draws from a wide variety of styles and subject matter. Her multiple portfolios reflect an interest in fantasy, spirituality, mysticism, and the natural world. Her unique “beaded paintings” are a combination of bead work, painting and miniature mosaic. Her “Photo-Illustration” portfolio consists of artwork that is digitally “painted” on a computer, with the assistance of a variety of digital tools. Her unique “Faux Stained Glass” portfolio is a set of illustrations that started out as simple line drawings. Each piece was then “painted” in with photographs of real stained glass. The final effect is a very fluid illustration with the look of real stained glass.